The SmartRig+ 2-Channel XLR Microphone Audio Mixer from Saramonic is a portable microphone/guitar interface for recording professional-quality audio. 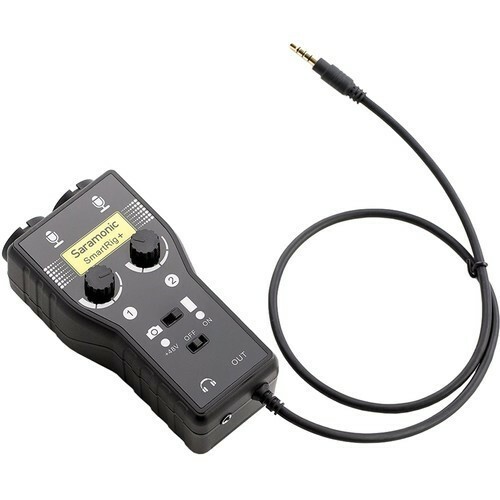 The SmartRig+ makes your recording work easier by connecting professional microphones and guitars (or other instruments) to your smartphone, tablet, DSLR camera, or video camera. With two independent channels, it allows you to connect and control gain on multiple microphones or guitars at the same time. The interface also features three types of inputs to accommodate any setup: two combo XLR / 1/4" inputs, and two 1/8" jack inputs for connecting any instrument or microphone. It allows you to toggle between mono and stereo output modes as necessary.